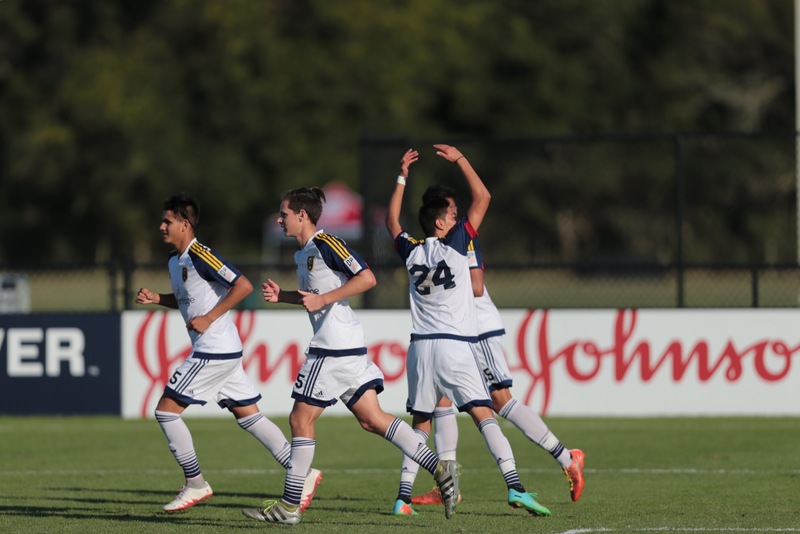 LAKEWOOD RANCH, Fla. (Dec. 3, 2016) - After going down twice in the first half, Real Salt Lake AZ U-15/16 utilized a hat trick from Sebastian Soto to earn a 4-2 victory and hand Atlanta United FC U-15/16 its first defeat of the 2016-17 Development Academy season on Saturday afternoon at Premier Sports Campus. Atlanta United FC broke through in the ninth minute when Thomas Toney chased down a long ball over the top. Winning it at the top of the area, Toney laid it off for Zyen Jones who burst into the RSL penalty area before driving a low blast inside the right corner. RSL AZ responded just five minutes later. A pass for Eduardo Blancas was cleared from the area, allowing midfielder Diran Bebekian to collect the ball on the right, before cutting into the box and unleashing a bullet into the opposite side netting to level the score at 1-1. A midfield battle ensued for much of the rest of the first half, but Atlanta United would pull back ahead before the break. Earning a free kick on the left in first-half stoppage time, Jones directed his service to the right post where James Brighton cleverly nodded back across goal for Dylan Gaither who headed the ball into the empty net. Real Salt Lake AZ's second reply came just two minutes into the second half when Steve Jasso's cross deflected off an Atlanta defender and fell for Luis Arriaga in space. He quickly sent a ball to the left for Eduardo Blancas, who beat his defender before forcing a save out of United goalkeeper Tyler Hogan, but Soto was there to bury the rebound for his first of the game in the 42nd minute. Determined not to go back down again, RSL poured on the pressure and were rewarded for their efforts by earning a penalty kick in the 51st minute. A quick pass from Luis Arriaga on the right found Soto, who took one touch before being barreled over in the area, forcing the center referee to point to the spot. Soto stepped up and sent Hogan to the right as he placed his effort inside the left post to give RSL its first lead of the match. With momentum going forward, RSL doubled their lead with another penalty kick just after the hour mark. In the 61st minute, Arriaga found the combination to unlock the Atlanta defense, slipping Blancas through alone with only Hogan to beat. The RSL attacker took one touch before Hogan clipped him, providing another spot kick. Looking for his hat trick, Soto kept it simple on the take, sending it to the left again to close the scoring in the 64th minute. With the result, Real Salt Lake AZ U-15/16s move to 9-3-1 on the 2016-17 Development Academy season and will close out the Winter Showcase on Monday at 11:15 a.m. ET against the New York Red Bulls. Atlanta United FC falls to 9-1-3 and will look to bounce back on Monday against Baltimore Armour, also at 11:15 a.m. ET.